If irritating ants have found their way into your home and invaded your life, you are not alone. According to research conducted by the National Pest Management Association, 25 percent of homeowners say ants are their main pest concern. This same study revealed that more than half of all homeowners have had problems with ants-making them the most prevalent pest nationwide. In addition to being a general nuisance, these bothersome pests can cause significant damage in your home by destroying wood and contaminating your food. 1. In many cases, ants enter your home in search of food. You can keep ants out by keeping your kitchen spotless and removing all accessible food sources. Always keep food, especially sweets, in clean, airtight containers. Rinse out recyclable containers, take garbage outside regularly and store it in sealed containers. Be sure to wipe down all countertops frequently with soap and water, and clean up any grease or spills immediately. 2. Avoid leaving pet food dishes out for long periods of time. You can create a moat to keep ants away from your pet food by placing the dish inside another shallow, larger dish with an inch of water in it. 3. Caulk and seal all cracks and crevices around your home's foundation that could provide entry from the outside, especially those areas leading to the kitchen where food is prepared. Trim any tree branches and shrubs that touch the outside of the house to prevent ants from gaining access to the house. 4. Eliminate sources of moisture or standing water that may attract ants. It is important to get any plumbing leaks fixed right away. 5. If ants do find their way into your house despite these precautions and they prove too big a pest to handle, always seek the help of a licensed pest professional. 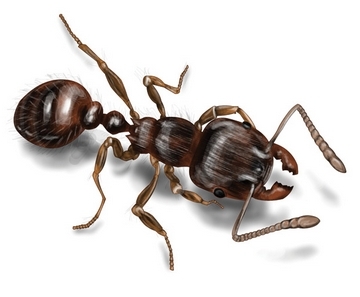 A pest professional will be able to identify which species of ants are present and can help you control the problem.